Canon’s original 400mm f4.0 DO IS USM super-telephoto was a hugely innovative model at the time of its introduction in late 2000. The use of DO, or diffractive optics — a pair of elements each with an opposing Fresnel-like patterned surface —dramatically lowered both the weight and size of the lens compared with conventional designs of the same focal length and maximum aperture. 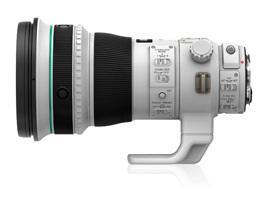 Canon also claimed that the unique optical construction of the 400mm f4.0 resulted in lower chromatic aberration than models using fluorite elements. The new model has similar weight and size advantages of the original (albeit with a slight increase), and adopts a new gapless construction between the two DO elements. 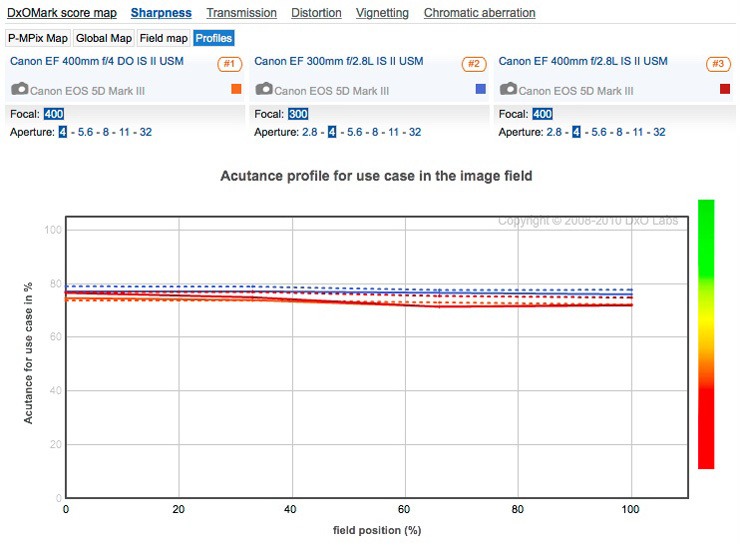 These elements are also positioned deeper within the optical formula, which Canon claims reduces flare. Although not an L-series model, the new lens boasts a similar level of construction, with aspherical and UD glass, environmental sealing, 4-stop image stabilizer, and both SWC (Sub Wavelength Structure) and fluorine coatings. Compared to the current 400mm f2.8, this new model is reassuringly compact, measuring just 5.04 x 9.16″ (128 x 232.7 mm) and weighing 4.63 lb (2.1 kg). It is available to pre-order at $6,899. 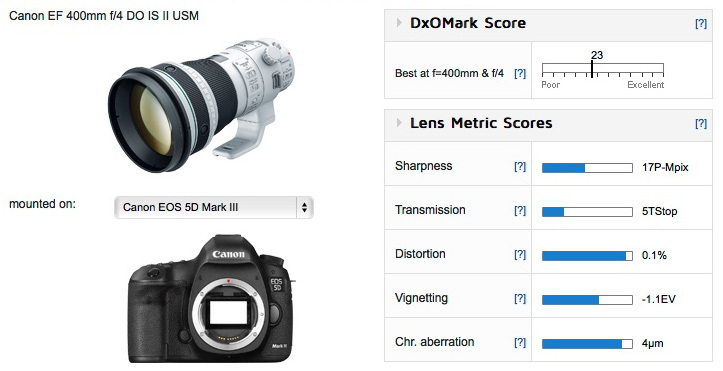 Achieving an overall DxOMark score of 23 points tested on the Canon EOS 5D Mark III, the EF 400mm f4.0 DO IS USM ranks in 27th place among the the 51 Canon EF models in our database, which includes zooms as well as primes. 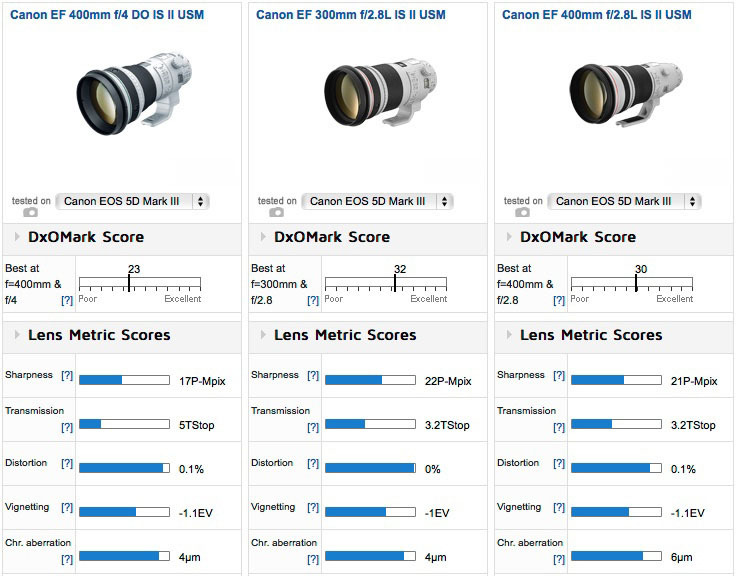 Despite its score, it’s a very good performer and ahead of such models as the EF 70-300mm f4-5.6L IS USM, the EF 300mm f4L IS USM, and the EF 100-400mm f4.5-5.6L IS USM (this last is in 49th place). While it is behind some of the more recent super-telephotos in ranking, it is comparable to the EF 200-400mm f4L IS USM Extender and the EF 500mm f4L IS II USM in optical performance, and both of these lenses are substantially heavier and larger, not to mention much more expensive. Compared to the maker’s two top-performing models, the new EF 400mm f4 DO IS II USM isn’t quite in the same league, as both competitors offer a notable step up in performance. The EF 300mm f2.8L IS II USM is an astonishing performer, but even so, the EF 400mm f2.8L IS USM is only marginally behind. Wide-open, the 400mm models perform similarly. Neither one is able to match the 300mm f2.8 IS II USM, but when they’re stopped down to f4 and lower, both trump the 400mm DO across the field. Light loss at maximum aperture is somewhat disappointing, at close to 2/3rds of a stop, but distortion and vignetting are similar between the models, particularly vignetting between the 300mm models when wide-open; when stopped down, however, the two faster models have the advantage. However, chromatic aberration is well controlled on the new 400mm f4.0 DO. As you might expect, when wide-open, the two faster models have slightly more CA across the field, although the 300mm performs much like the 400mm f4 DO. This also applies when stopped down to f4, although the 400mm f2.8 continues to have higher levels of chromatic aberration than either of the other lenses. 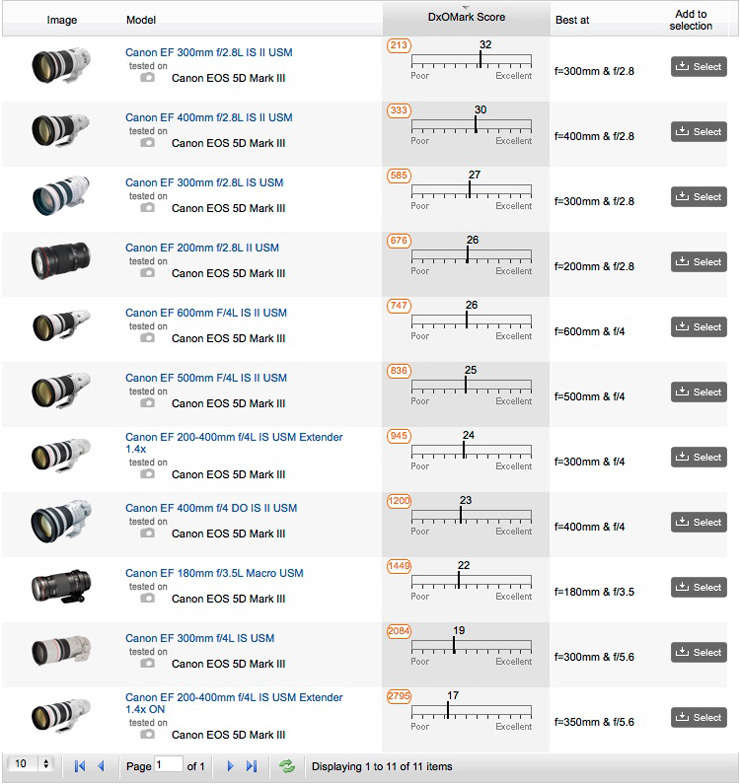 While it’s unfortunate that we don’t have data on the original EF 400mm f4.0 DO IS USM or the EF 400mm f5.6L USM with which to make more comparisons, it’s clear the new model is an attractive option. While it might not be able to match the premium EF 300mm and 400mm f2.8L IS II USM models, in optical quality it’s not far off and it has the added advantage of being smaller and lighter than both — in fact, it’s almost half the weight of the EF 400mm f2.8L. Anyone considering carrying the EF 400mm f4.0 DO IS USM any distance will surely appreciate the weight savings and be unlikely to be disappointed with the image sharpness, particularly wide-open where it counts the most in lenses like these.